Rat liver and kidney damage shown following ultra low dose Roundup exposure. Glyphosate-based herbicides (GBH) are the major pesticides used worldwide. Converging evidence suggests that GBH, such as Roundup, pose a particular health risk to liver and kidneys although low environmentally relevant doses have not been examined. Glyphosate (Roundup) used worldwide, poses a health risk to liver and kidneys at low dose. More research needed. To address this issue, a 2-year study in rats administering 0.1 ppb Roundup (50 ng/L glyphosate equivalent) via drinking water (giving a daily intake of 4 ng/kg bw/day of glyphosate) was conducted. A marked increased incidence of anatomorphological and blood/urine biochemical changes was indicative of liver and kidney structure and functional pathology. In order to confirm these findings we have conducted a transcriptome microarray analysis of the liver and kidneys from these same animals. 2 year rat study with very small doses of glyphosate given in drinking water results in microscopic and functional changes in liver and kidney cells. The expression of 4224 and 4447 transcript clusters (a group of probes corresponding to a known or putative gene) were found to be altered respectively in liver and kidney (p < 0.01, q < 0.08). Changes in gene expression varied from −3.5 to 3.7 fold in liver and from −4.3 to 5.3 in kidneys. Among the 1319 transcript clusters whose expression was altered in both tissues, ontological enrichment in 3 functional categories among 868 genes were found. First, genes involved in mRNA splicing and small nucleolar RNA were mostly upregulated, suggesting disruption of normal spliceosome activity. Electron microscopic analysis of hepatocytes confirmed nucleolar structural disruption. Typical cell functions were altered by very low dose ingestion of Roundup. Cellular level malfunction of gene expression and repair occurred. Second, genes controlling chromatin structure (especially histone-lysine N-methyltransferases) were mostly upregulated. Third, genes related to respiratory chain complex I and the tricarboxylic acid cycle were mostly downregulated. Pathway analysis suggests a modulation of the mTOR and phosphatidylinositol signalling pathways. Gene disturbances associated with the chronic administration of ultra-low dose Roundup reflect a liver and kidney lipotoxic condition and increased cellular growth that may be linked with regeneration in response to toxic effects causing damage to tissues. Observed alterations in gene expression were consistent with fibrosis, necrosis, phospholipidosis, mitochondrial membrane dysfunction and ischemia, which correlate with and thus confirm observations of pathology made at an anatomical, histological and biochemical level. Low dose exposure to glyphosate caused scarring, cell death, leaking from energy stores of the cells, cellular powerhouse malfunction and lack of oxygen to cell structures. Our results suggest that chronic exposure to a GBH in an established laboratory animal toxicity model system at an ultra-low, environmental dose can result in liver and kidney damage with potential significant health implications for animal and human populations. Isn't much need to translate that. How do I avoid Glyphosate? Avoid the plants that have been modified to use Roundup without being killed. These Roundup Ready crops include. Corn-Maize- used in food, corn oil and animal feed. Canola-used in oil, and animal feed. Alfalfa- used in animal feed. Cotton-used in clothing, oil and animal feed. Soybeans-used in food, soybean oil, and animal feed. Sugar Beets-used in food and animal feed. Green and Yellow Squash- not available for home consumers-used in food and animal feed. Sweet Corn-not available for home consumers-used in food and animal feed. Papaya- used in food and animal feed. Tomatoes, Potatoes, Pigs and Rice are not in current production although there were genetically modified versions of these. 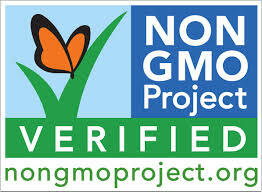 Look for this label on food products you purchase. These products have been verified to not contain genetically modified genes. Or purchase certified Organic products. The meats we eat unless certified organic are almost 100% feed some sort of genetically modified foods with glyphosate residues. So far, no studies have been run on health detriments.